Isn’t it funny how kids love doing stuff like that? My 11 yr old insists on drying clothes on the line when it’s her week to do the laundry, even in the winter! We had a family BBQ yesterday and when it was over all the adults ended up in the house while the kids stayed outside to play. We watched them through the big living room window and had to laugh. The girls had set up a big clothesline and were playing “laundry” washing all the jackets and coats and hanging them on the line to dry. You are the queen. Good thing we’ve had one semi sunny day to dry things in. First.check this out….found it on flickr and thought of you.http://flickr.com/photos/dadadreams/2384378537/in/set-72157604365750536/second… I tired the clothes line thing about 10 years ago. 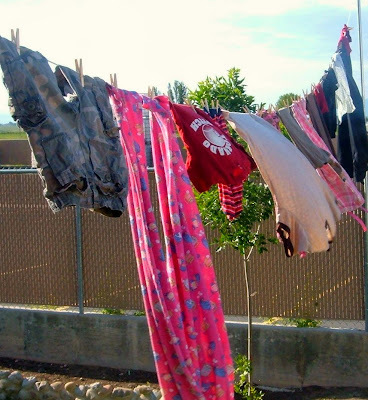 Thought wow, I could save a bundle on money by not using the dryer and I had all 5 kids at home…..forgot the clothes on the line on the side of the house for two days….not good for reds…everything was faded!!! Didn’t save any money cause I had to go out and buy more!Moral to the story…..have your sister call if she still sees clothes out overnight! Hanging laundry out to dry is one of my favorite things to do. It is beautiful.